Aquarius has picked up the pace significantly this season. Diving headlong into the downward spiral that lead to the real life Manson Family murders means that the drama and intrigue seem to fly by, episode to episode. And while the historical speculation may move the plot, let us not forget that ultimately Aquarius’s central story is that of the trials and tribulations of Sam Hodiak, and his seemingly perpetual inability to catch a break. 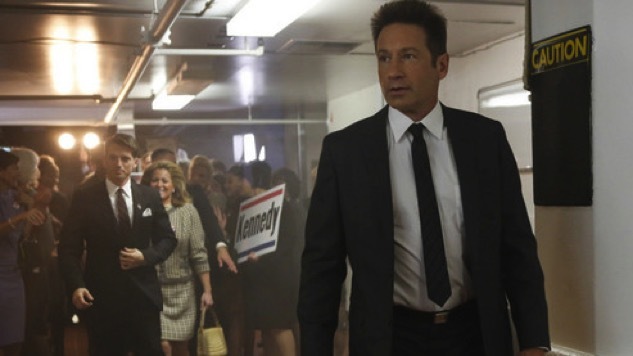 Here are the 6 times that made us wish Hodiak was familiar with the phrase “face palm” in last night’s Aquarius. It’s always nice to hear from an old friend. College roommates and military service buddies get a lot of mileage when it comes to moving a television show’s plot along, especially when trying to establish a connection to otherwise untouchable celebrity characters. And what better use of that plot device than to have said friend introduce you to Bobby Kennedy? Except of course for Hodiak, a meet up with his old war buddy, Boyle, can’t possible be that straightforward. Swinging by to talk about a job working as a pre-presidential bodyguard is one thing, but finding out your good friend wants you to track down and threaten the prostitute that’s blackmailing them? That’s the kind of favor that requires more than just a phone call on your birthday and a one-episode guest appearance. No one likes being outsmarted, especially when you suspect you’re the smartest guy in the room. And yet, it does seem to happen quiet a lot around here. Hodiak’s extreme desire to smack tonight’s high and easily manipulated Shafe over the head is pretty understandable when the revelation of Ben Healy’s uncle/lawyer/ex-roomate finds its way down to the police station. Sam, sometimes the manipulation tactics you rely on so heavily will come back to bite you. Still it takes a manipulator to know a manipulator, and Sam’s parting shot of, “Your client’s way too smart to be innocent,” pretty much assures me that Healy is the man they’re looking for. Hmmmm, it’s always the quiet ones. When you find yourself in a conversation comparing the management practices of pimps, you have to get the sense that rock bottom isn’t very far away. This one’s pretty self explanatory, even if Martin O’Reilly did turn out to be relatively decent. For a pimp. Personally, I would have enjoyed it if they’d told him together, but that may have felt a little too much like a prostitute intervention. Finding out that Boyle was visiting prostitutes at least three times a week makes it pretty clear that his life isn’t really all that together though, so maybe it wouldn’t have hurt. Sam’s buddy is set up pretty early on as one lacking any kind of self-awareness. He even goes so far as to justify visiting prostitutes as some kind of living memorial to who his wife used to be, by only frequenting “Irish girls.” So maybe the revelation that these prostitutes were very much not Irish should have been the first hint that Boyle isn’t exactly aware of the other people around him. Finding out that his blackmailer is actually his sweet, devoted wife Mary may not come as a shock to us, but for Hodiak it’s just one more reason he should have taken the day off. As a general rule, we tend to be an optimistic sort in the United States. We’re always looking for solutions. For a natural pessimist like Sam, that can prove a bit frustrating and awkward. Imagine being the only person working on a group project who can foresee all the ways in which it could fail, and you’ll have a pretty clear insight into Sam Hodiak’s point of view. Now imagine that instead of your ninth grade English teacher asking you to explain Nathaniel Hawthorne, it’s the future president of the United States asking for your advice about how to improve race relations in 1969. If you’re a dedicated pessimist (he’d probably say realist) like Sam, you probably can’t imagine a more awkward situation. So try dodging the question, and when Bobby’s too pushy to accept a well phrased, “I don’t know” try to tap that nihilism down. Because no politician wants to hear “People don’t change.” And then, not only are you wrong, but you’re wrong in the national news. For all my history buffs out there, you’re already aware of how this Kennedy story ends. For those less factually inclined, I think the final shot of tonight’s episode makes it pretty clear where this is going. It’s just another opportunity for Sam to look at the crumbling world around him and shrug out a heavy sigh. Because for Sam Hodiak, people really don’t change. The justifications and excuses just get more complicated. Katherine Siegel is a Chicago-based freelance writer and director and a regular contributor to Paste. You can find out more by checking out her website, or follow her on Twitter.